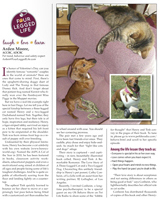 “Pet Lounge” hits the airwaves! 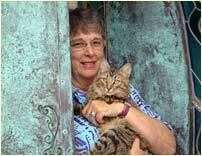 The Television Series About Unforgettable Pets and Extraordinary People that celebrates, entertains, and informs on every aspect of pet care, health, companionship and lifestyle. Unleash your curiosity! 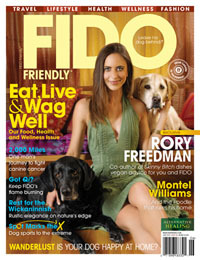 Sit, discover, wag and enjoy as Pet Lounge presents a world of insider tips and wide-ranging stories that entertain, enlighten, enrich, and inspire every pet lover’s life. In honor of Valentine’s Day, can you identify famous "romantic" couples in the world of animals? Here are ones that come to mind: First, there's the spaghetti-sharing doggy duet of Lady and the Tramp in that famous Disney flick. And don't forget about that patient frog named Kermit who finally won over the flamboyant Miss Piggy in the Muppet movies…. Henry & Tink in the U-T San Diego! “No one gave that memo to Tink and Henry,” she says. 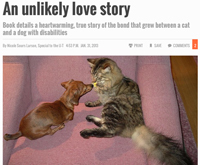 They are two innocent animals who discovered each other through their senses and developed an instinctive trust. 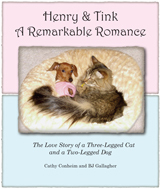 Henry & Tink’s brand-new book is now available! Discounts offered when you order five books or more. We two-leggers can be far too proficient at what-if and should-have thinking. By replaying past mistakes and investing far too much time trying to orchestrate future scenarios, we don’t always allow ourselves ample time to embrace living in the present and enjoy life’s small delights. Our nation struggles with a medical system focused on disease, not on health, and on procedures, not on caring. Henry, Dolly, and Tink show us that if we focus on love and acceptance, we can help each other and ourselves in ways we cannot predict and in ways that unite us all in healing our hearts. This calendar can be used year after year to record friend's and loved ones' birthdays, plus all profits go to help Julian Elementary School. You can purchase it by clicking here. 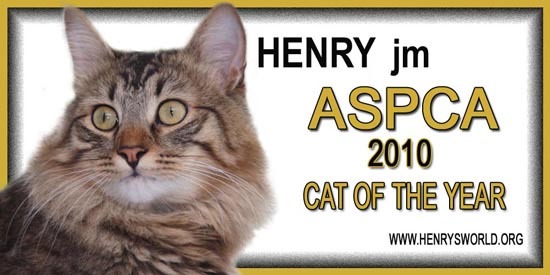 ASPCA’s Cat of the Year, Henry jm, Releases Ouch! 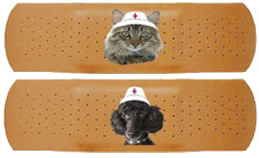 The World’s First Emotional Bandage! Ouch! Emotional Bandage: In a world where apathy and indifference seem so prevalent, the bandage symbol sends a clear message that something is wrong. It compels us to ask "where does it hurt?" and "how can I help you?" Start a dialogue using Ouch! Julian Elementary School is the first school to which he has brought all of his project materials. They kids love it! “Cat of the Year” Award! 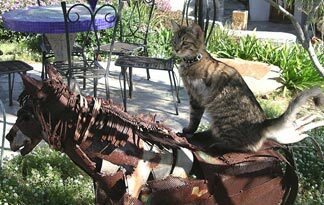 La Jolla’s Henry Named ASPCA Cat of the Year for his transformational work teaching tolerance, resiliency and courage. Outstanding animals and people are honored for their deeds at this year’s American Society for the Prevention of Cruelty to Animals Humane Awards Luncheon in New York City. 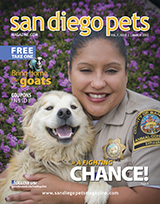 Awards shine attention on rescue dogs, youth efforts. is a quarterly publication dedicated to the brave men and women who died while serving in the Armed Forces, and to their survivors. 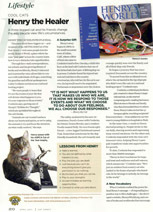 The Spring publication includes an article on Henry and the healing power of storytelling.